This fabulous 4 bedroom family home offers flexible accommodation over 2 levels whilst being set within a sizeable (approx.) 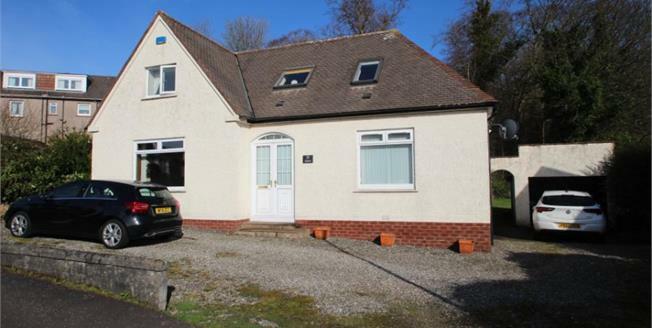 1/4 acre of garden grounds and enjoys upper views of the Clyde Estuary. Ground floor accommodation comprises: Entrance vestibule; Reception hall with under stair storage cupboard; A good size lounge which is open planned to the dining area; Kitchen with integrated double oven, microwave, 5 burner gas hob, extractor, fridge/freezer as well as space and plumbing for a washing machine and dishwasher, door gives access to rear garden; Downstairs master bedroom with 3 piece en-suite shower room; Family room/4th double bedroom. Upper accommodation comprises: Large upper hallway which could be utilised as a study area; Bedroom 2 is double sized with large walk in dressing room/storage cupboard; Bedroom 3 is a further good sized double bedroom with views over roof tops to the Clyde Estuary and beyond; Three piece bathroom with over bath shower. The subjects are enhanced by double glazing and a gas fired central heating system with "combi" boiler. To the front lies a large stone chipped driveway which affords ample parking and leads to the single garage, which has power. The rear garden, which back onto mature woodland, is made up mainly of lawn with a mature garden area made up of a mixture of shrubs/bushes/fauna. A decked area lies adjacent to the rear of the property and gives access to the kitchen. Timber shed, with power, is included.